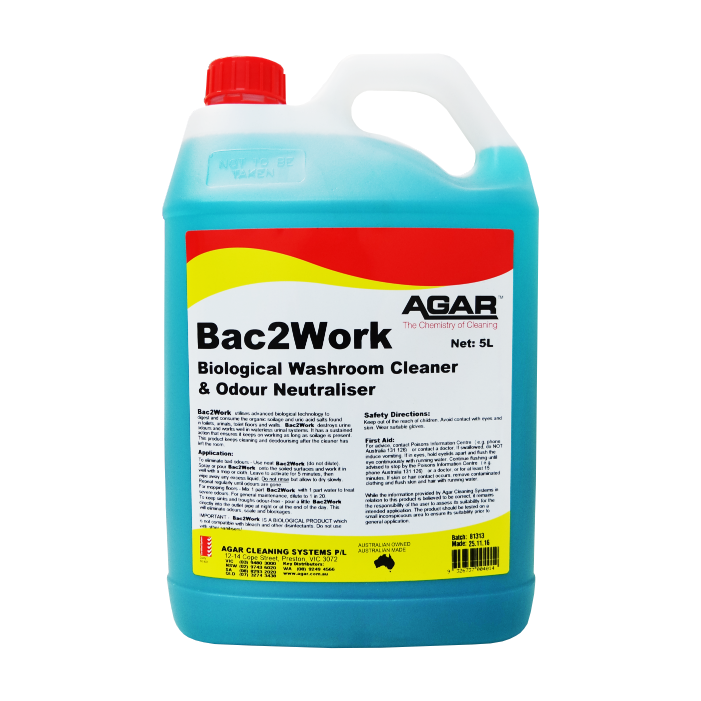 Agar Bac2Work Washroom Cleaner and Odour Neutraliser is a bacteria-powered toilet and urinal cleaner that digests organic soilage and uric acid salts in and around toilets, urinals, and walls. Bac2work has been proven to work great in waterless urinal systems. This non-hazardous washroom cleaner effectively stops bathroom odours. What makes Bac2work an excellent odour neutraliser is that it continues to clean and deodorize the room as long as the soilage is present, even after the cleaner has left the room. 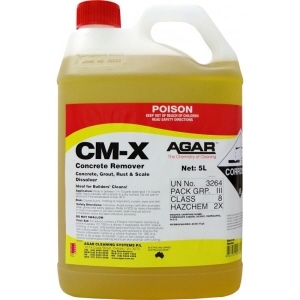 Agar Metal Max is a rich, powerful metal polish for cleaning, removing stains and bacteria, and shining stainless steel surfaces as well as chrome, copper, brass, enamel and ceramic cook-tops. 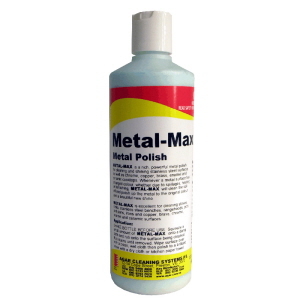 It actually polishes dull metal surfaces, cutting away stains and marks. Whenever a metal surface has changed colour, whether due to spillages, heating or tarnishing, METAL-MAX will clean off the soil and bacteria and also polish up the metal to the original colour and a beautiful new shine. Agar Drain Solution Biological Drain Opener deodorises and unblocks pipes and drains that have a history of bad odours by utilising advanced biologically-active ingredients to digest and consume the organic soilage, food scraps and fats. It keeps on digesting waste matter until the blockage is gone and positively stops foul-smelling odours. 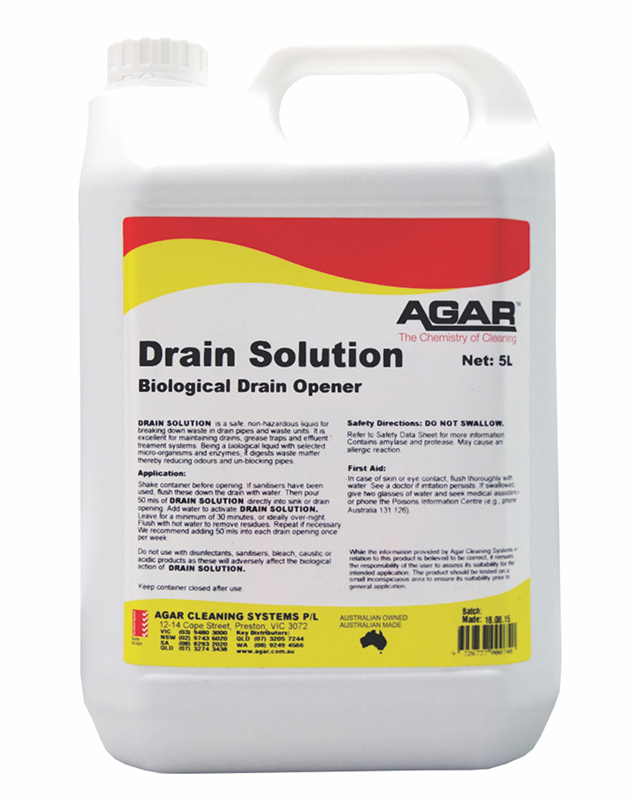 Agar Drain Solution is designed for used in all plumbing systems including septic tanks. It won't damage porcelain, PVC, stainless steel, cast iron, chrome or ceramic pipes and surfaces. Since Drain Solution is biologically-active, it must not be mixed with disinfectants, sanitisers, hot water, bleach, caustic or acidic detergents as these materials will de-activate the good bacteria and enzymes that are present and needed for the product to work. Available in 1L and 5L. 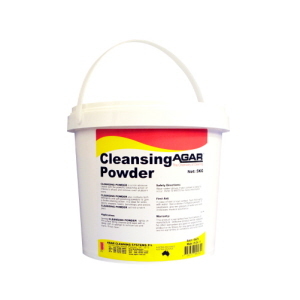 Agar Cleansing Powder is a mild-abrasive, non-scratching powerful cleaner with detergent and chlorine to remove dirt and stains from hard surfaces. It has a lemon scent to leave surfaces with a fresh lemon fragrance. This powder detergent is ideal for use on sinks, basins, showers, toilets, benchtops and stoves. It will not scratch glass, porcelain, enamel or hard metals. 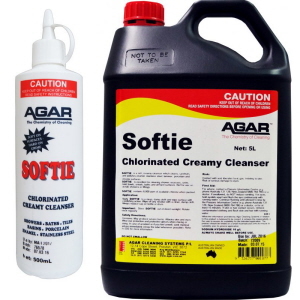 Agar Softie Chlorinated Creamy Cleanser with soft polishing abrasives which boost soil removal and leave surfaces crystal clean and shiny. It kills germs and mould and removes water stains, soap scum and body fats from ceramics, stainless steel, porcelain & enamel surfaces in kitchens & washrooms. Agar Softie cleans, sanitises and polishes enamel, stainless steel, laminex, porcelain and chrome surfaces. This creamy cleanser and sanitiser is excellent for shower recesses, sinks, toilet bowls, urinals and all hard surfaces. Not suitable for cleaning shiny plastic surfaces. 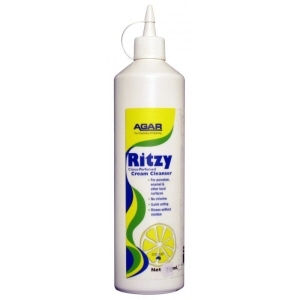 Agar Ritzy Cream Cleanser is a citrus-perfumed creamy cleanser that rapidly attacks soil, is soft, mildly abrasive, does not contain chlorine and rinses free with no residue. It is used for cleaning and polishing porcelain, enamel, baths, sinks, toilets and other hard surfaces. 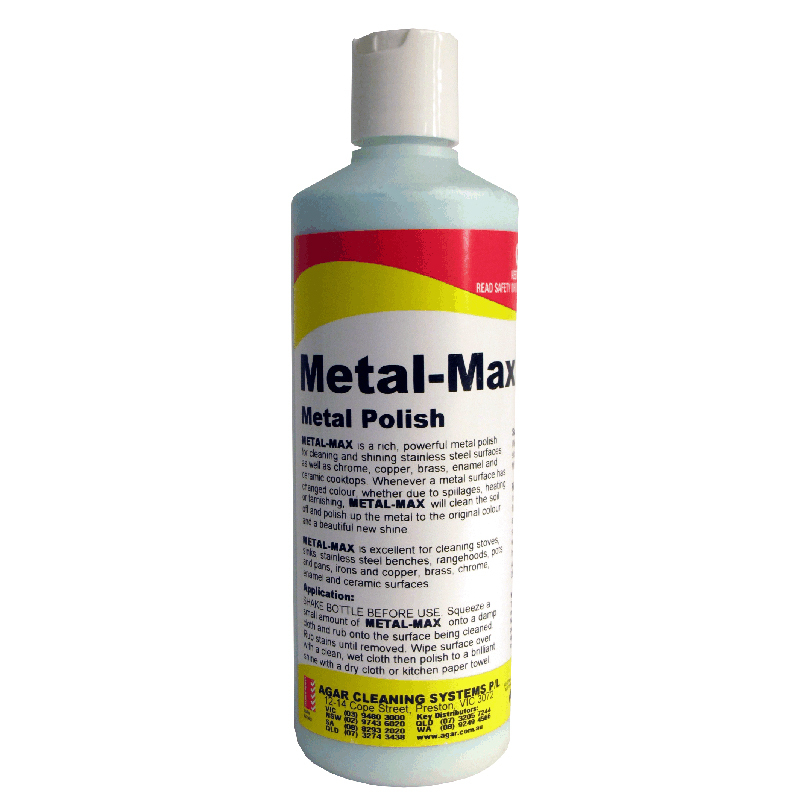 Not recommended for use on aluminium, acrylic, fibreglass or other surfaces that scratch easily. 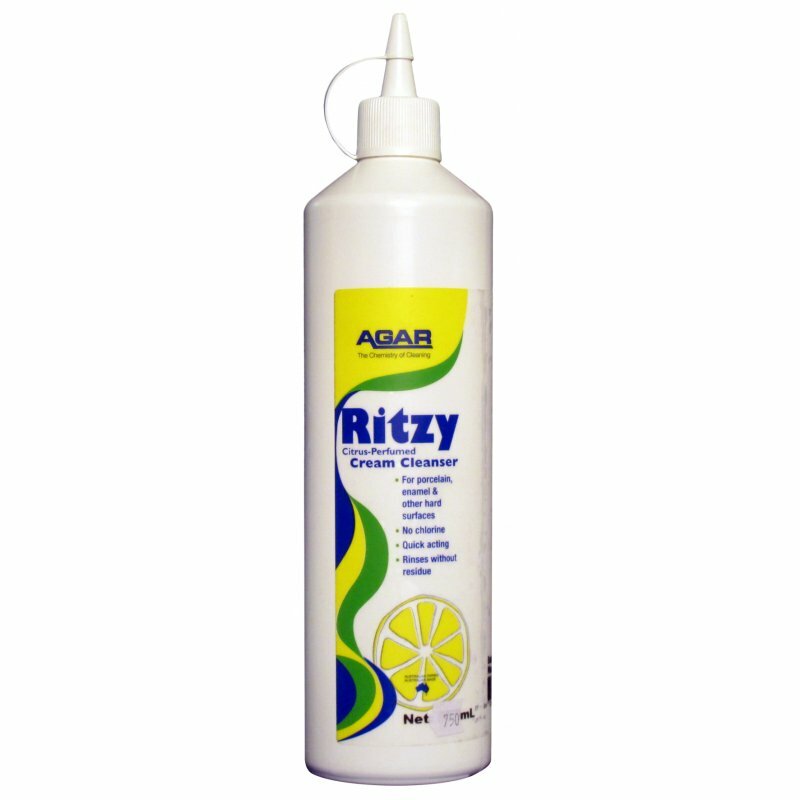 Agar Ritzy Cream Cleanser may be used on laminate benchtops such as Formica®or Laminex® but should be used with only gentle wiping and no rubbing hard in one spot. 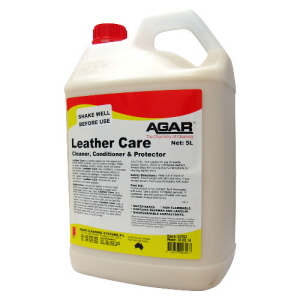 Agar Leather Care is a cleaner, conditioner and protector for smooth, fully-pigmented, finished leather surfaces. It is formulated with mild, biodegradable detergents so it cleans gently but effectively. Great when used on fully-pigmented, smooth leather surfaces such as leather lounge suites, leather upholstery in motor cars, handbags, jackets, shoes and boots. As it dries it leaves a wax-rich film that impregnates the leather to both improve the sheen and moisturise. 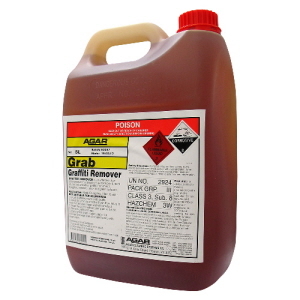 Agar Grab Graffiti Remover is a very potent solvent-type and ink removal agent. It is water-emulsifiable so it can be rinsed away effectively with water. 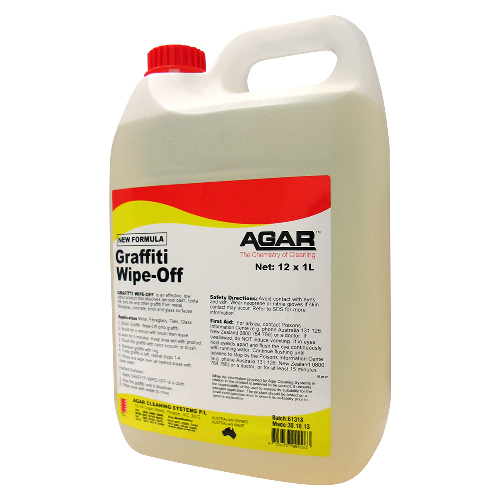 For specialist use on walls and brickwork and other surfaces subjected to paint and ink graffiti. Not to be used on painted surfaces or aluminium metal. Available in 5L. Agar Graffiti Remover is odour-free, thickened liquid that clings to vertical surfaces. 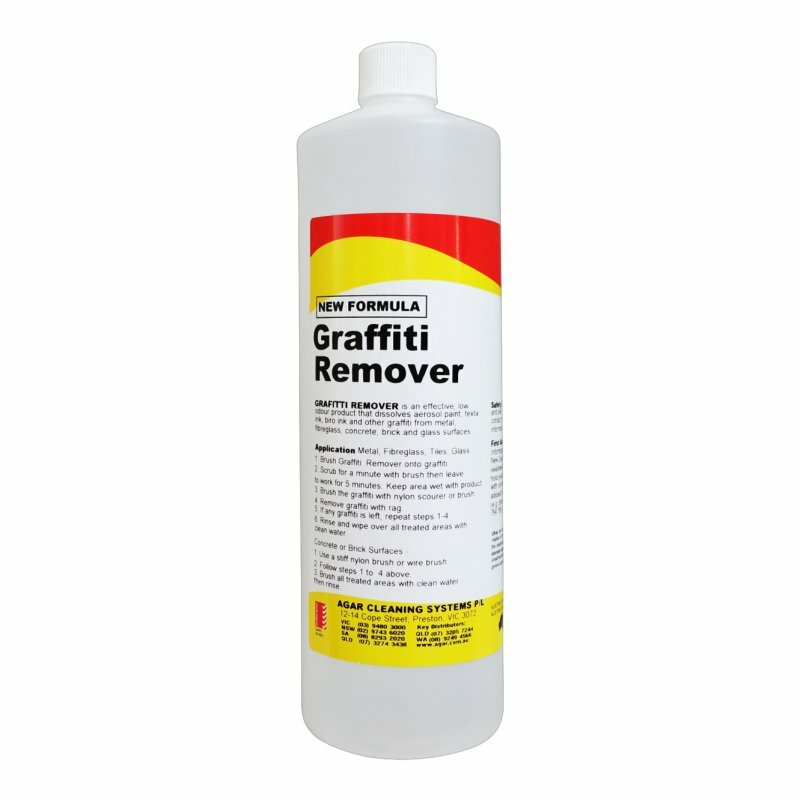 It is effective in removing graffiti from metal, fibreglass, concrete and carpeted surfaces. 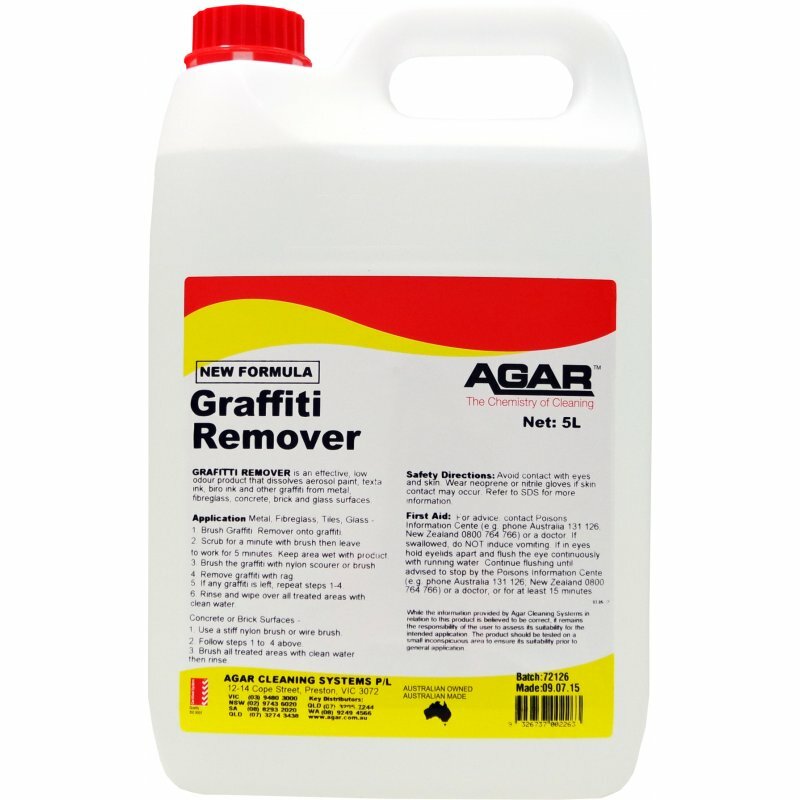 Agar Graffiti Remover quickly and thoroughly dissolves aerosol paint, felt-tipped pen ink, ballpoint pen ink and other graffiti from metal, fibreglass, concrete, brickwork and even carpeted surfaces. It is ideal for use in railway carriages, on walls and brickwork, and all other surfaces subjected to graffiti. 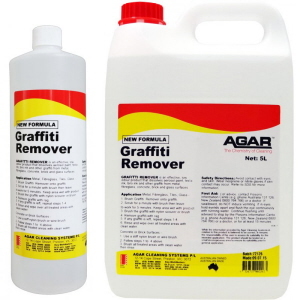 Agar Graffiti Wipe-Off Graffiti Remover quickly removes graffiti from painted surfaces that could be damaged by more aggressive Graffiti Removers. It dissolves felt-pen, ballpoint pen and spray paint from a variety or surfaces excluding varnished material. Odour-free liquid, will remove graffiti from metal, fibreglass, concrete and carpeted surfaces. Can be used on painted surfaces. 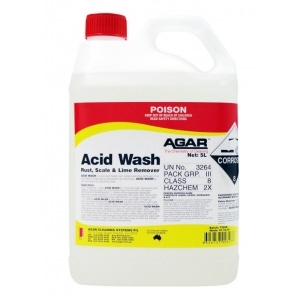 Agar Acid Wash Rust Scale Lime Remover is a concentrated acide based cleaner used for de-scaling dishwasher interiors. 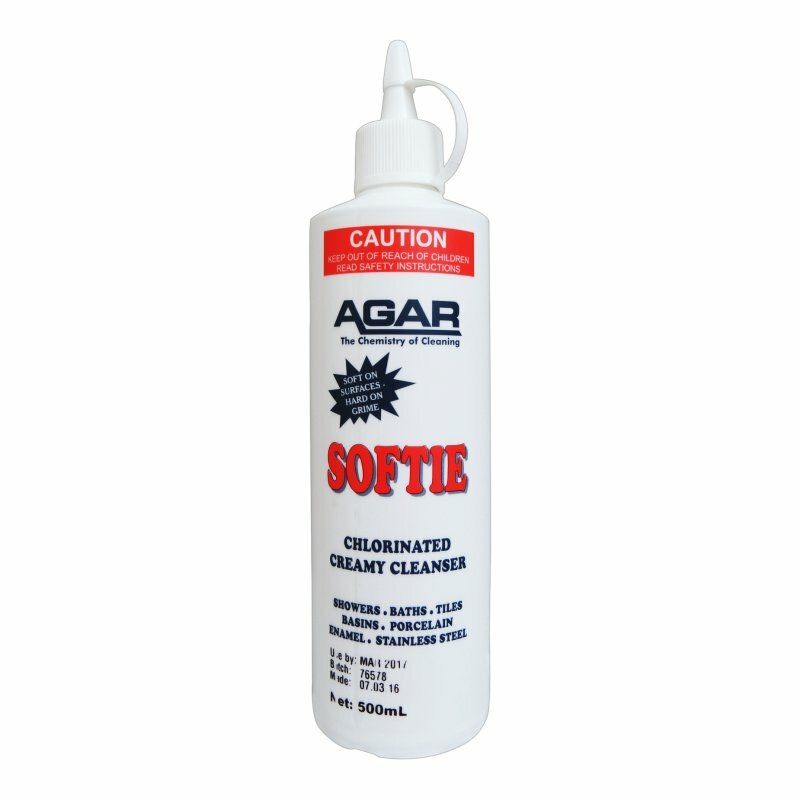 It dissolves rust, scale and lime build-ups and removes excess grout from ceramic tiles. It is non-corrosive to stainless steel. Available in 5L. 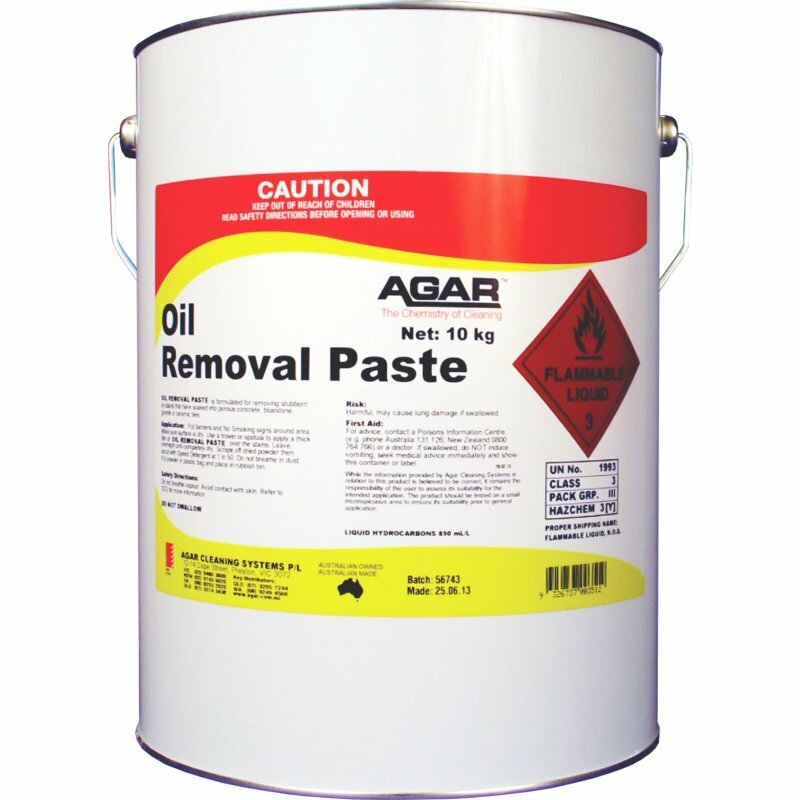 Agar Nu-Glo is a water-based, odourless and non-flammable polish and protectant for vinyl, rubber, sealed wood, plastic and finished leather surfaces. 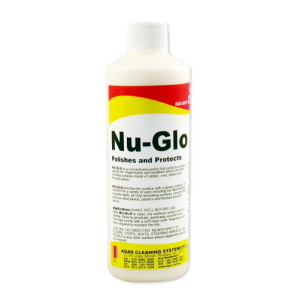 As oxidation and the effects of ultraviolet light can damage such surfaces, Nu-Glo leaves a rich coating of silicone oils on the surface which repels these harmful external agents. Agar Nu-Glo is a blend of emulsified, substantive silicones designed to clean and protect surfaces and leave a glossy, uniform finish. It is useful for treating car dash-boards and tyres, escalator belts, vinyl furnishing surfaces, counter-tops, stainless steel panels, plastic surfaces, interior woodwork and finished smooth leather chairs. NOTE: NEVER apply NU-GLO to floors, steps, seats, steering wheels, car pedals, motor cycle seats or any other surface where slipperiness would be a hazard. 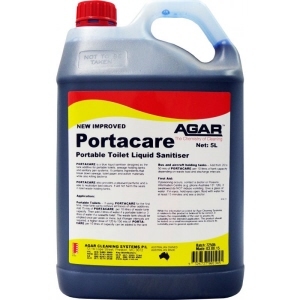 Agar Portacare Portable Toilet Liquid Sanitiser designed as the waste tank additive for portable toilets, sewage holding tanks and sanitary pan systems. It contains an effective germ-killing agent to control bacteria, together with a deodoriser and a perfume. This blue liquid sanitiser is recommended for use in the waste tanks of portable toilets and cassette toilets, as well as in bus and aircraft holding tanks. Its strong blue colour so the waste tank contents are masked by a blue colouration. Available in 5L and 20L. Agar Truck Wash is a hard-surface concentrated detergent for washing trucks, cars, boats and building exteriors. This vehicle detergent breaks down and removes road dirt, mud, oil films, exhaust soot and insect residues from trucks, cars, 4WD’s, caravans, boats, motorbikes, trains and trams. It is effective for cleaning paintwork, rubber trims and tyres, chrome, aluminium, glass, mag wheels, fibre glass and vinyl surfaces. It is also great for exterior hard surfaces exposed to road grime and the elements, such as brickwork, walls, canopies, blinds, roof tiles, paintwork and windows. It is a ‘Quick Break’ detergent, allowing total segregation of oil and water. Agar Turbo Gleam Wash and Wax Car and Truck Cleaner that protects paintwork from the elements and gives it a sparkling shine. It removes road dirt, oil and carbon from truck, car and bus paintwork, rubber, chrome and glass. It makes vehicle cleaning easier with repeated use. 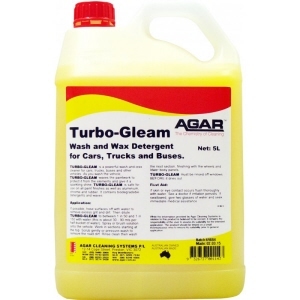 Agar Turbo Gleam is formulated for use on trucks, cars, 4WD‟s, caravans, boats, motorbikes, trains and trams. It is effective for cleaning paintwork, rubber trims and tyres, chrome, aluminium, glass, mag wheels, fibre glass and vinyl surfaces. It may be used with soft or hard water. It is a „Quick Break‟ detergent, allowing total segregation of oil and water. 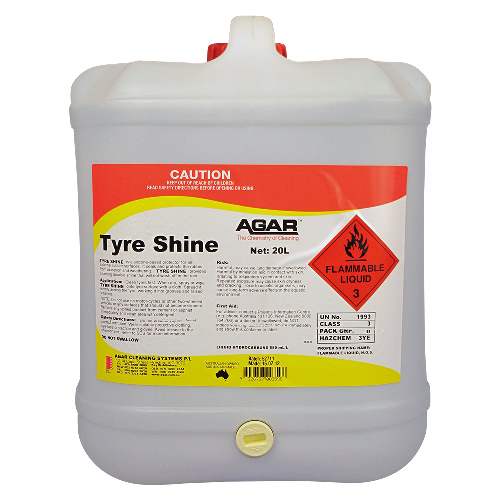 Agar Tyre Shine Rubber Protector is an easy-to-use, fast drying silicone based protector that seals, shines, and protects vehicle rubber tyres. It leaves rubber dark and glossy without looking oily or wet. It provides a lasting durable shine that will not wash off in the rain. It is ideal for car, truck and bus tyres but not recommended for two-wheeled vehicles. Available in 20L. 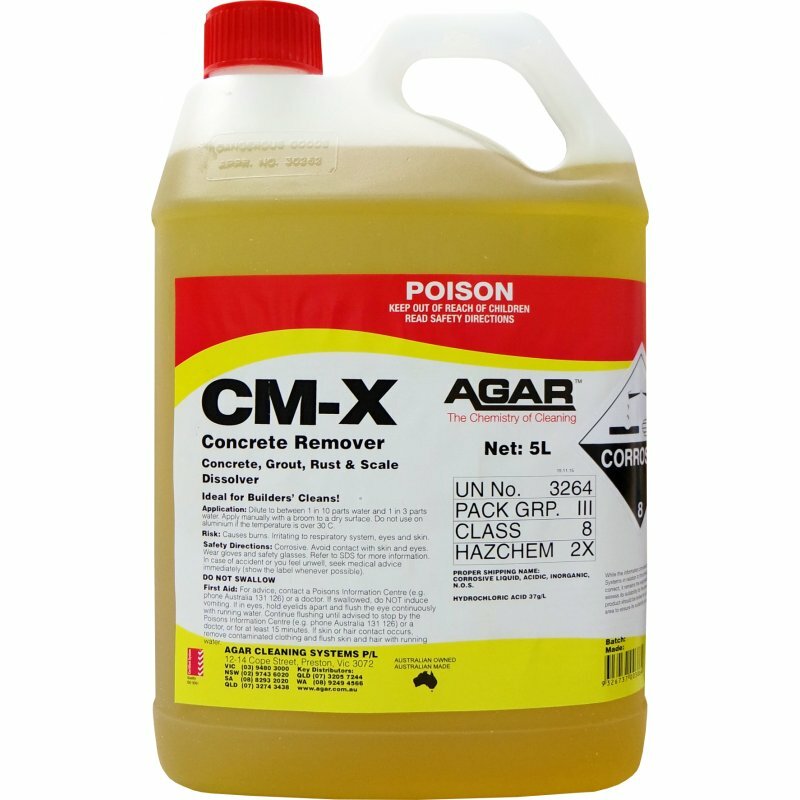 Agar CM-X Concrete Remover dissolves concrete, cement, and grout as well as lime, scale, and rust from brick walls and acid resistant hard surfaces quickly and efficiently. It is low-odour, works like strong acid but less corrosive and much safer to handle. Based on an organic-salt complex it contains corrosion inhibitors and is non-fuming. 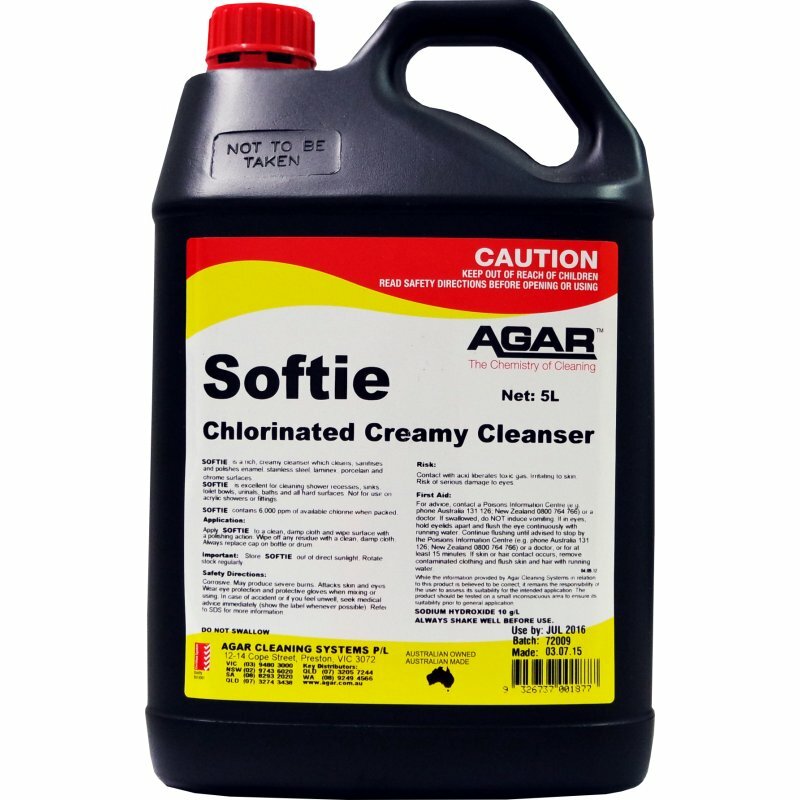 It is an excellent brick cleaner and also dissolves splashes and cement dust from concrete mixing trucks and machinery. 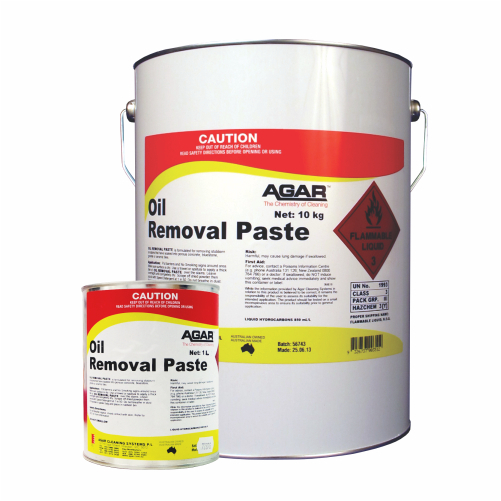 Agar Concrete Remover CR-60 is a higher powered formula, fast-acting, low-odour, non-corrosive concrete remover for dissolving lime, concrete and mortar residues from concrete mixers, trucks and trowels used in laying and transporting concrete as well as from surfaces that have been splashed with concrete. It can be used on plastics and paintwork that is in reasonable condition and it will have little effect on steel, stainless steel and iron. Contains corrosion inhibitors. CR-50 is phosphate free and fully biodegradable. Agar High Purity Distilled Water that has no dissolved salts or impurities. Ideal for use in washing windows and topping up lead batteries after they have been charged. 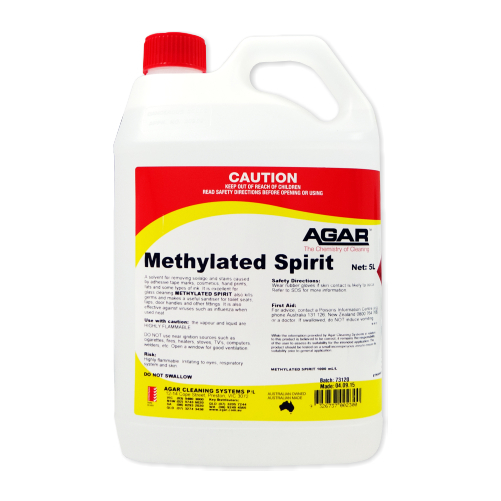 Agar Methylated Spirit is fast-drying alcohol solvent for removing soilage and stains caused by adhesive tape marks, cosmetics, hand prints, fats and some types of ink. It is also a powerful germicide. It can be used on hard surfaces and glass. Also works as a sanitiser and glass cleaner. General industrial solvent that can be used for cleaning windows and sanitising toilet seats. 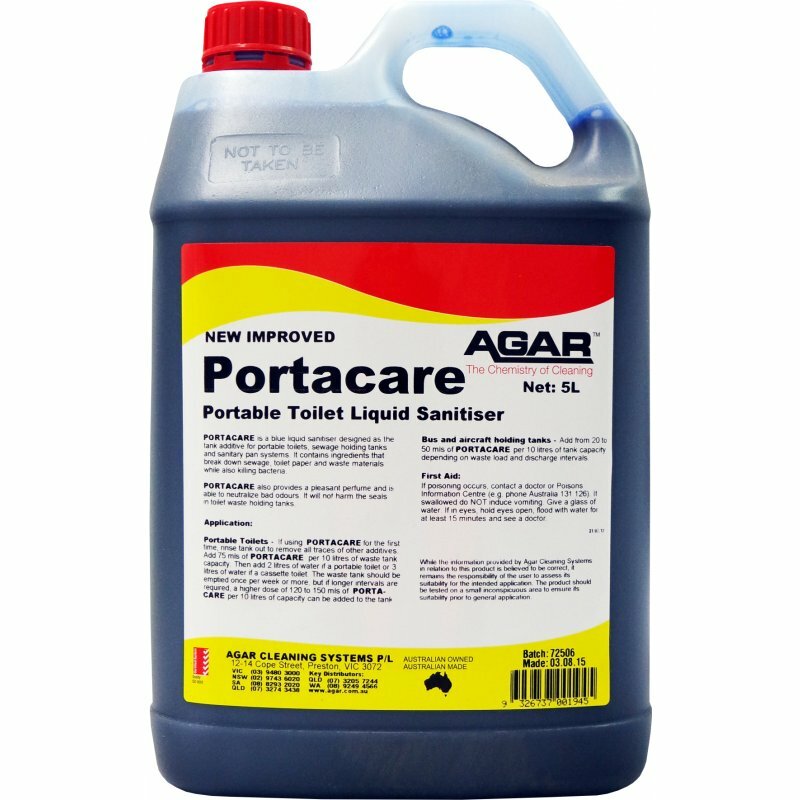 Agar Isopropyl Alcohol is 100% isopropyl alcohol (also known as rubbing alcohol and Isopropanol) and is used as a solvent, sanitiser and window cleaner. It quickly removes “sticky tape” residues, cosmetic stains, fingerprints and smears and some ink from hard surfaces. It is used as a solvent and a sanitiser in the cleaning industry, but also has many other uses including as an antiseptic and in chemical reaction processes. Agar Drive Away Degreaser is an extremely powerful hydrocarbon based cleaner and simple-to-use oil and grease remover for concrete and stone pavement. It literally drives the stain right out of the surface to be cleaned with no scrubbing required. Perfect for oil stains left by leaking motor vehicles. 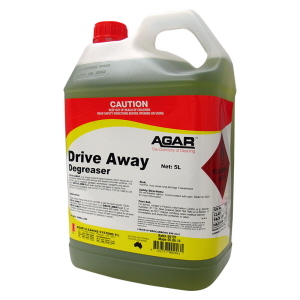 Removes oil and grease from engines, machinery, tools, driveways, workshop floors etc. Available in 5L and 20L. 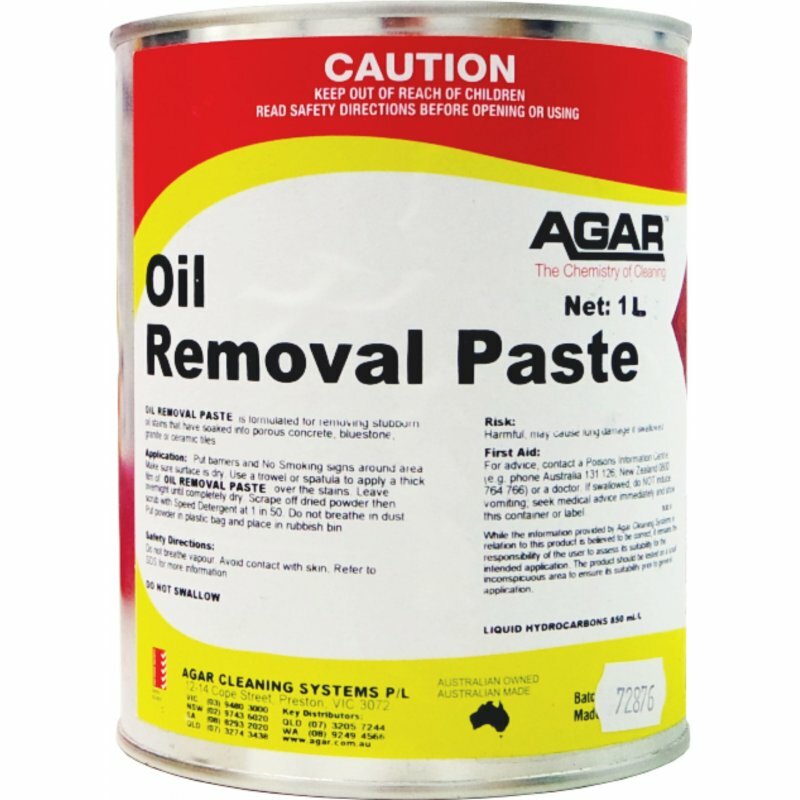 Agar Oil Removal Paste is a white, absorbent paste containing hydrocarbons. It works using the “poultice method” for drawing out stubborn oil stains that have soaked into porous concrete and stone floors and wall tiles. It can be used on concrete, bluestone, granite, ceramic tiles, terracotta, marble, limestone and terrazzo. Oil Removal Paste removes engine oil, hydraulic fluid, brake fluid, cooking oil, fat and dripping. Available in 1L and 10kg.